The International Conference on “New Approaches to Groundwater Vulnerability” was held from 4-8 June in Ustroń, Poland. It was the third conference on contemporary groundwater vulnerability issues to be organised in Ustroń, one of the best known Polish resorts and spas in the Beskidy Mts. The conference was organised by University of Silesia in Katowice, forming part of its 50th anniversary celebrations, with co-operation with IAH, UNESCO IHP, and the Association of Polish Hydrogeologists. The conference brought together 79 delegates from 21 different countries. The conference program included seven thematic sessions of oral presentations, a poster session and a field trip. The topics covered: development of the vulnerability concept (two sessions), groundwater vulnerability assessment for karstic areas, groundwater vulnerability to nitrate pollution, groundwater vulnerability assessment in order to climate change and efficient land use management, groundwater vulnerability and pollution risk in agricultural and industrialized areas and also international and national projects related to groundwater and surface water management and protection (special session). Both oral and poster presentations were of high quality, and individual sessions ended with lively and fruitful discussions. The mid-conference trip visited the Upper Silesia industrial region, to consider problems of exploitation of coal deposits and the functioning of industrial and service-residential space in the region. 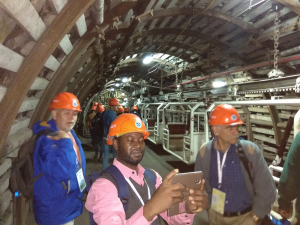 Participants visited the historic Guido Mine in Zabrze where the coal exploitation lasted from 1871 until 1996, and an authentic workers’ settlement, built in 1908-1918 in Katowice (Nikiszowiec). The organisers would like to thank all the conference sponsors, with special thanks to the UNESCO International Hydrological Program (UNESCO-IHP) for its financial support, including covering the costs of participation of eight scientists from developing countries.